In 1884 his first wife, Alice Lee Roosevelt, and his mother died on the same day. 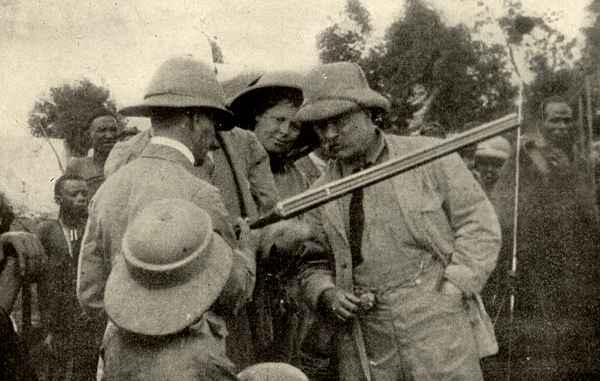 Roosevelt spent much of the next two years on his ranch in the Badlands of Dakota Territory. There he mastered his sorrow as he lived in the saddle, driving cattle, hunting big game--he even captured an outlaw. On a visit to London, he married Edith Carow in December 1886. 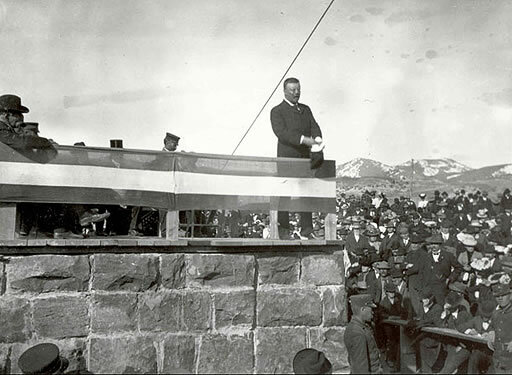 At the end of Roosevelt's two-week visit, he spoke at the construction site of a new arch at the north entrance of Yellowstone. 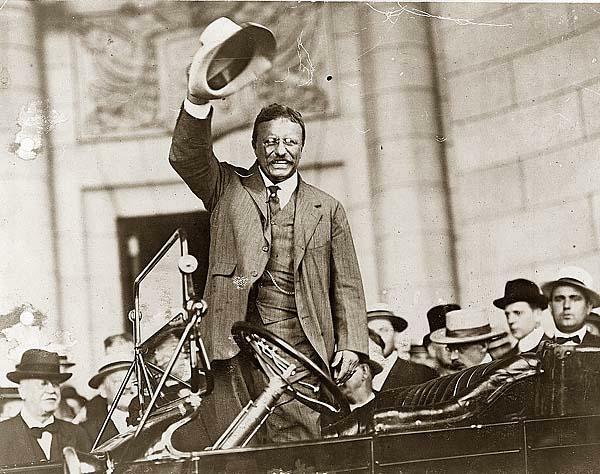 In his speech, Roosevelt reminded people of the essential democratic principle embodied by the parks; they were created "for the benefit and enjoyment of the people." These words were later carved into the arch's mantle as a reminder of why the park was there – and for whom. 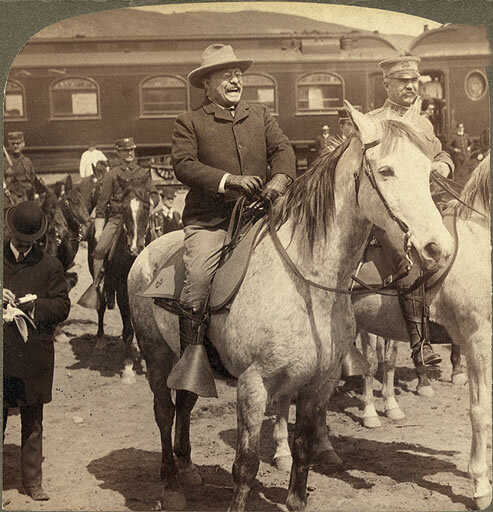 Theodore Roosevelt, the noted conservation president, had an impact on the national park system extending well beyond his term in office. 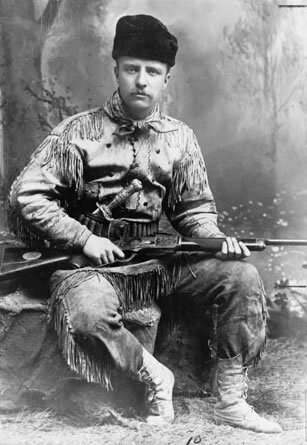 As chief executive from 1901 to 1909, he signed legislation establishing five national parks: Crater Lake, Oregon; Wind Cave, South Dakota; Sullys Hill, North Dakota (later redesignated a game preserve); Mesa Verde, Colorado; and Platt, Oklahoma (now part of Chickasaw National Recreation Area). 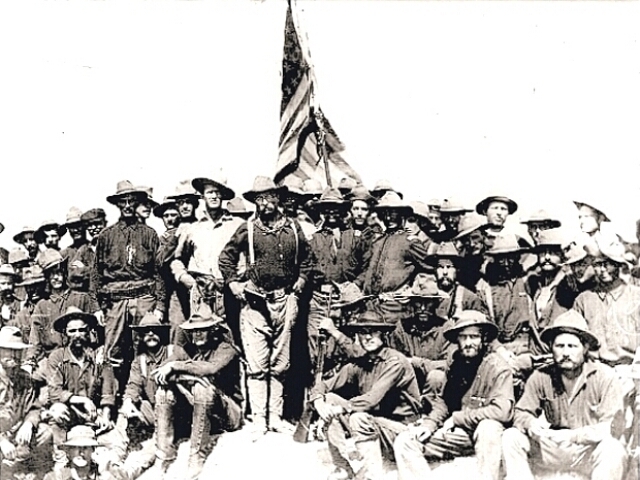 Another Roosevelt enactment had a broader effect, however: the Antiquities Act of June 8, 1906. While not creating a single park itself, the Antiquities Act enabled Roosevelt and his successors to proclaim ãhistoric landmarks, historic or prehistoric structures, and other objects of historic or scientific interestä in federal ownership as national monuments. 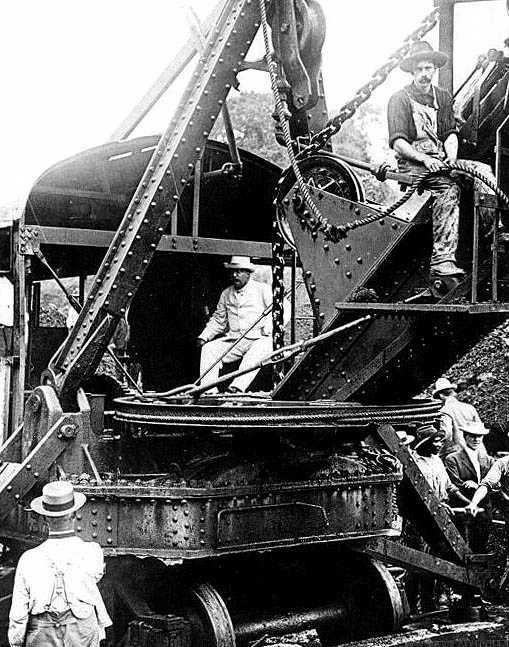 Roosevelt did not hesitate to take advantage of this new executive authority. By the end of 1906 he had proclaimed four national monuments: Devils Tower, Wyoming, on September 24 and El Morro, New Mexico, Montezuma Castle, Arizona, and Petrified Forest, Arizona, together on December 8. He was also prepared to interpret the authority expansively, protecting a large portion of the Grand Canyon as a national monument in 1908. By the end of his term he had reserved six predominantly cultural areas and twelve predominantly natural areas in this manner. Half the total were initially administered by the Agriculture Department and were later transferred to Interior Department jurisdiction. 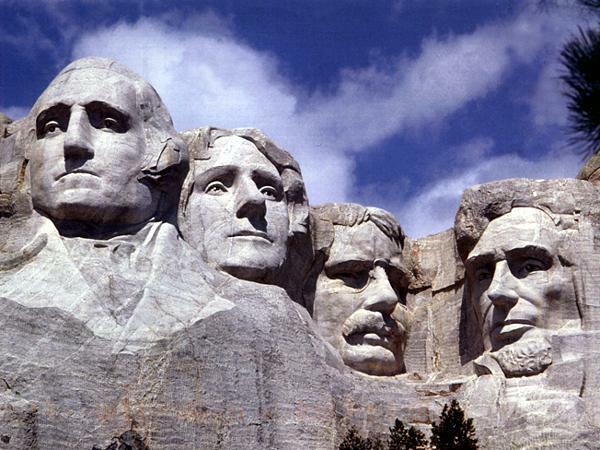 Later presidents also used the Antiquities Act to proclaim national monuments,105 in all. Forty-nine of them retain this designation today; others have been retitled national parks or otherwise reclassified by Congress. The Antiquities Act is the original authority for about a quarter of the 378 areas composing the national park system in 1999. Recalling this legacy of Theodore Roosevelt, it seems appropriate that he is now commemorated by five park system areas as many as honor Abraham Lincoln and more than for any other president. Theodore Roosevelt Birthplace National Historic Site in New York City, Sagamore Hill National Historic Site in Oyster Bay, New York, Theodore Roosevelt Inaugural National Historic Site in Buffalo, Theodore Roosevelt National Park in North Dakota, and Theodore Roosevelt Island in Washington, DC, trace his career and memorialize his contributions to America. The National Park Service, administrator of these parklands and the many others Roosevelt made possible, has particular cause to honor his memory. 1. Devils Tower, Wyoming, September 24, 1906. 2. El Morro, New Mexico, December 8, 1906. 3. Montezuma Castle, Arizona December 8, 1906. 4. Petrified Forest, Arizona, December 8, 1906. 5. Chaco Canyon, New Mexico, March 11, 1907. 6. Lassen Peak, California, May 6, 1907. 7. Cinder Cone, California, May 6, 1907. 8. Gila Cliff Dwellings, New Mexico November 16, 1907. 9. Tonto, Arizona, December 19, 1907. 12. Pinnacles, California, January 16, 1908. 13. Jewel Cave, South Dakota, February 7, 1908. 14. Natural Bridges, Utah, April 16, 1908. 15. Lewis & Clark, Montana, May 11, 1908 . . . . (later given to the State of Montana). 16. Tumacacori, Arizona, September 15, 1908. 17. Wheeler, Colorado, December 7, 1908 . . . . (given to the Forest Service in 1950). 18. Mount Olympus, Washington, March 2, 1909. "We demand that big business give the people a square deal; in return we must insist that when anyone engaged in big business honestly endeavors to do right he shall himself be given a square deal." "...the man who really counts in the world is the doer, not the mere critic-the man who actually does the work, even if roughly and imperfectly, not the man who only talks or writes about how it ought to be done." "A healthy-minded boy should feel hearty contempt for the coward and even more hearty indignation for the boy who bullies girls or small boys, or tortures animals."... "What we have a right to expect of the American boy is that he shall turn out to be a good American man." "Be practical as well as generous in your ideals. Keep your eyes on the stars, but remember to keep your feet on the ground."